Oftentimes the deepest hurt we experience comes from our families. Spouses, kids and relatives can push our buttons like no one else. They can be ungrateful, unkind, and just plain irritating. Today’s gospel lesson, which might be called Jesus’ most famous parable, is an amazing illustration about God’s love, but it’s also a lesson about parenting. It shows the quandary of a father whose children have grown beyond his ability to control. We see three stages in this story. Stage one is rebellion. In every parent-child relationship there’s going to be a struggle for control. Who’s in charge? It’s a power thing. At birth, a parent is 100% in control. But as they grow, power gets transferred. Your control is not permanent, nor should it be. But a problem arises because kids want control sooner than we want to give it. They think they deserve it for some reason. And kids have a tendency to misbehave. Here we see the classic confrontation. “Father, give me....” That’s the root of rebellion. If I could just do as I please, if I could just be my own boss, and not have to answer to anyone, life would be great. Rebellion is unpredictable. The dad has two sons who are radically different, though both are strong willed. You can never tell which is going to be the rebellious one. It’s not age related. Here, it is the younger child who caused the initial problem. “…the younger son gathered all he had and took his journey into a far country, and there he squandered his property in loose living.” He’s having one great time. He is finally beyond his father’s control. And in this scenario the father did three difficult things. And keep in mind the dad is a model for us because in this parable he represents God, and God is the perfect Father. First, the younger son set off and the father did not chase him. He released him. From birth we prepare for our kids to leave. One of the most difficult tasks of parenting is knowing when to let go. It’s hard. Second, the father let him make his own mistakes. This lad took everything his dad gave him and blew it. He wasted it all. At first everything was great. He probably tried a lot of different things, especially those that were forbidden at home. He tosses the values he was taught out the window, rejects his heritage and has a great time squandering his wealth. Rebellion is always a waste of life. Kids are not too wise with money. Did the father know that his son was going to spend it all? Absolutely. Did he know his son was headed for trouble? Sure. But his dad knew that there are some things we only learn through pain. His son was stubborn. The only way he was going to learn it was through the school of hard knocks. He would never acquire at home or in the classroom the experience he was about to absorb in the real world because convictions come from life, not from a classroom. It’s risky but it was the only way for this boy. The third hard thing for the father to do was to let his son realize the consequences of his choices. There is a price to be paid for rebellion. “And when he had spent everything, a great famine arose in that country, and he began to be in want.” Do not be deceived, God is not mocked.” What you sow you will reap. “…so he went and hired himself out to a citizen of that country who sent him into his fields to feed pigs. And he longed to fill his stomach with the pods the pigs were eating but no one gave him anything.” He’s broke. He’s friendless. He hits bottom. For a kosher Jew, feeding pigs is about as low as you can go. He has empty pockets, empty stomach, and an empty life. It’s been said that once a kid reaches grade school, the parent is no longer the primary influence in their life. Nature has a way of disciplining our children in ways that we can’t. Let them reap the consequences of their own decision. As a rule we never change until we get desperate. God has to get our attention. He gets homesick. He gets desperate. So he says in repentance, “I will return to my father.” And he heads off for home not because he needed a change of clothes but because he had a change of heart. In the beginning he says, “Father, give me...” When he comes home he says, “Father, make me...” He’s broken, but what beauty comes from that break; fellowship with his father is restored. Because the father waited, the son came to stage three: The Return. Remember this is the ideal father. This is God. This is what God would do. In fact, it is what God does to you in your rebellion, and it becomes a model for us. Some people might think, “How could he accept him without lowering his standards? How can he accept his child when he doesn’t approve at all of what he did?” We confuse acceptance with approval and there is a big difference. You can accept a child or a person without approving of their lifestyle. After all, Christ loved the prostitutes without endorsing prostitution. The language of acceptance is always physical. He ran, he hugs, he kisses. Love is expressed. “Then the son said, `Father, I have sinned against heaven and against you, and I’m no longer worthy to be called your son.’” Confession is so easy when you know you’ve already been accepted. The Prodigal Son is forgiven completely. We should follow his example. 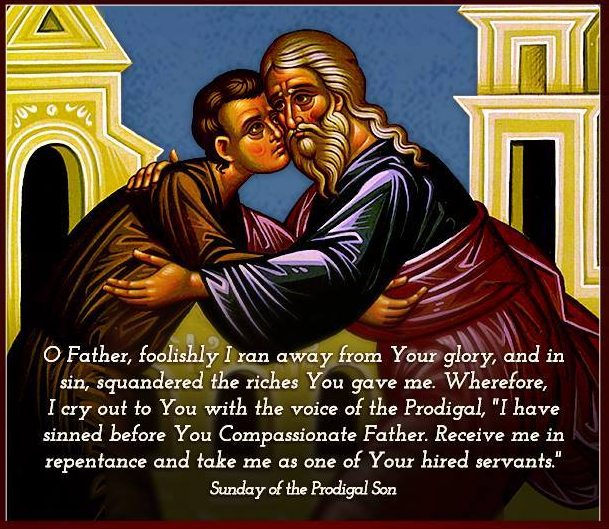 “… the father said to his servants. ‘Quick! Bring the best robe and put it on him and put a ring on his finger and sandals on his feet and bring the fatted calf and kill it. Let’s feast! Let’s celebrate!’” The father removed all traces of his son’s rebellion. The father gave him a second chance. He forgave him completely. In Jewish culture the robe was a sign of sonship. The ring was a signet with the family crest. You’d push it in the wax to pay bills. The ring gave him unlimited credit; a sign of trust and reinstatement into the family. This story is referred to as The Prodigal Son but actually it should be called The Loving Father because he is the hero of the story. The most remarkable thing about this story is what it teaches us about God and God’s heart for lost souls. God is not a cold, distant, heartless, uncaring entity Who can’t wait to pass judgment on His rebellious children. Jesus tells us that God is a loving Father Who aches to be in communion with every one of us. This gospel lesson tells us that when we come to ourselves and turn our hearts towards home and lean wholly on His grace, we will discover the God of the universe running out to meet us. A loving Father Who, when we come face to face with Him in spite of our sin and failures, will throw His arms around us and shower us with love. All the saints and angels of heaven rejoice. It is home. In our Father’s house there are all the comforts. In our Father’s house, there is life. Wouldn’t it be great if we could fall in love again with our Father and learn from His joy and His patient love? What a perfect lesson, what a perfect beginning as we prepare to enter into Great and Holy Lent. Father Stephen Ziton was ordained to the Holy Priesthood in 1993 and has been the Presiding Priest at the Holy Trinity Greek Orthodox Church in Casper, Wyoming since 2010. He served honorably in the United States Marine Corps. and has extensive experience in law enforcement. To contact Father Stephen or to learn more about Orthodox Christianity in the Casper area follow the link: http://holytrinitycasper.org.